When it was first detected, the asteroid was nearly as far away as the Moon's orbit, although that was not initially known. The asteroid appeared as a streak in the series of time-exposure images taken by the Catalina telescope. As is the case for all asteroid-hunting projects, the data were quickly sent to the Minor Planet Center in Cambridge, Massachusetts, which calculated a preliminary trajectory indicating the possibility of an Earth impact. 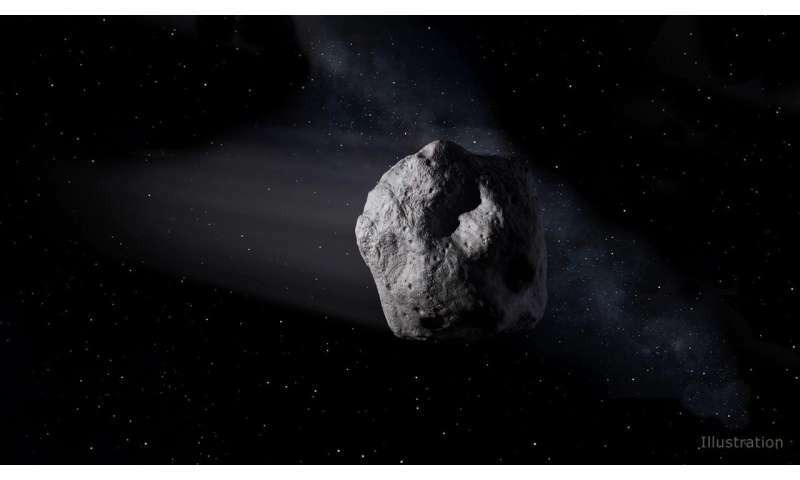 The data were in turn sent to the Center for Near-Earth Object Studies (CNEOS) at NASA's Jet Propulsion Laboratory in Pasadena, California, where the automated Scout system also found a high probability that the asteroid was on an impact trajectory. Automated alerts were sent out to the community of asteroid observers to obtain further observations, and to the Planetary Defense Coordination Office at NASA Headquarters in Washington. However, since the asteroid was determined to be so small and therefore harmless, no further impact alerts were issued by NASA. "The discovery of asteroid 2018 LA is only the third time that an asteroid has been discovered to be on an impact trajectory," said Paul Chodas, manager of the Center for Near-Earth Object Studies (CNEOS) at JPL. "It is also only the second time that the impact location was predicted well ahead of the event itself." 3. Both of the above; or something else. No. 2 would be good to check; it would be a dangerous setting for the near future. Yes. And there can be a few reasons for that. If more foxes get reported, either more people look out for them, or there are more foxes in the area. There is more observational capacity, improving communications and increasing public awareness of such events. Everybody deludes themselves that they are the only one in the world getting rained on. That the passing car that splashed the puddle of muddy water all over them? Did it on purpose! Hell, maybe the driver was malicious but it is our instincts to blame, to anthromorphise what we directly perceive. Yeah...It's a bit like everyone gets bombarded with news about batteries in electric cars catching fire and therefor gets the notion that these technologies are unsafe. But when you look at the actual numbers then e.g. a fire in an ICE vehicle is about 5 times as likely per kilometer traveled. New technologies get reported on. Old technologies having their usual kinds of failures isn't 'newsworthy'. I don't think my hypothesis no. 2 can be disproved based on available data. It probably cannot be proven either. So we're either better at seeing asteroids or there are more of them near Earth lately. Just because a particular hypothesis cannot be disproven doesn't give it any probability to be true, either. This cannot be disproven. Does this mean that the chance that a god exists is 1% or 50% or 99%?. None of the above. It's just a random statement.